A day of pleasant weather, gently rippling flags and low foot traffic in the Bahamas meant the course was open for low scores and we had a pair of 7-under 65s from Patrick Cantlay and Patrick Reed, who finished the afternoon three in front. Others flirted with the lead and Bubba Watson held it for a large chunk of the day before slicing his seven-iron into the wet stuff at the par-3 17th and taking double. Bubba would finish with 69 alongside Alex Noren (finished birdie-birdie-birdie-eagle-bogey-par-bogey) while Dustin Johnson and Henrik Stenson both came in with 68s to share third. In all, 12 of the 18-man field broke par, with 2016 winner Hideki Matsuyama propping up the standings with a 74 despite a pair of closing birdies. Full leaderboard: -7 Patrick Cantlay, Patrick Reed, -4 Henrik Stenson, Dustin Johnson, -3 Alex Noren, Bubba Watson, -2 Justin Rose, Justin Thomas, Bryson DeChambeau, -1 Keegan Bradley, Jon Rahm, Jason Day, Evs Tony Finau, Gary Woodland, Rickie Fowler, +1 Xander Schauffele, Tiger Woods, +2 Hideki Matsuyama. Revised outright betting: 7/2 Patrick Cantlay, Patrick Reed, 11/2 Dustin Johnson, 12/1 Henrik Stenson, Justin Rose, 14/1 Bryson DeChambeau, Justin Thomas, 18/1 Bubba Watson, 22/1 Alex Noren, 25/1 Jon Rahm, Rickie Fowler. After light winds in round one, they pick up on Friday and could max out at about 18mph for Saturday’s third round. It’ll be a little overcast for day two but with pleasant temps touching 80 degrees. Patrick Cantlay (65) – Cantlay only found out he’d be playing here a couple of weeks ago and said he figured out a game plan and did some good work at home to get ready. It certainly paid off. 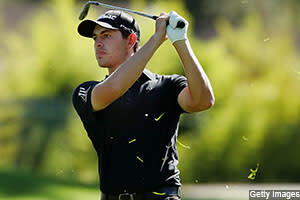 Despite finding the course a tough puzzle to crack (see quotes below), he returned the only bogey-free round, finishing with a rush of five birdies in the final six holes. Patrick Reed (65) – Some reunions are awkward but Reed walks to a different drum so no surprises he should stick his chest out and put on a show when playing with his Ryder Cup teammates for the first time since the ugly fallout of Le Golf National. Eight birdies, one bogey and a joint-low round at Albany for the 2015 runner-up here. And no sign of the rib injury he'd mentioned in Hong Kong. Dustin Johnson (68) – DJ usually starts well at this course and this is the third time in four starts at Albany he’s opened with 68 (other was 66). In 2015 and 2017 he fell away on the weekend so needs to cash in better. Was even par after 11 holes today but birdied four of the next five. Henrik Stenson (68) – The Swede, a runner-up at Albany in 2016, said he had low expectations when returning to action in Dubai a few weeks ago but still managed T12. More good stuff here today as he outpaced three bogeys with seven birdies. Justin Rose (70) – An uneventful scorecard for most of the day (14 pars) until a wild eagle-double bogey exchange at 11 and 12. Rose, who owns a property here, insists local knowledge doesn’t help much and with just three rounds in the 60s in 10 laps here perhaps we should believe him. Rickie Fowler (72) – Not Rickie’s day and his only deviation from par over the first 13 holes was bogey-6 at 9. Three late birdies at 14, 15 and 18 although compromised by double at 16. Notes: We’ve had three editions at Albany and some notable common ground. It’s not good news for the chasing pack as none of the three winners dropped out of the top five at the completion of any round. Indeed, that trio were all inside the top four after 18 holes. Note though Fowler came from seven back after 54 holes last year to win by four (61). Fate of the 18-hole leaders at the Hero World Challenge – where did they finish? Notes: While the three Albany winners were all prominent throughout the week, the actual first-round leaders have suffered mixed results. Tommy Fleetwood is the only one to have managed a top three while two of the five finished lower than halfway. Bubba has 12 wins on the PGA TOUR and eight of them have come on just three courses – Riviera three times, TPC River Highlands three times and Augusta National twice. He’s the ultimate course horse and, whatever form Bubba’s in, it’s a smart move to get him on board at any of those three venues. He’s had two previous looks at Albany, winning on debut in 2015 and adding T6 in 2016. For those eight rounds he’s 36-under-par. So he loves it, right? Nope. These were his quotes when he completed his first lap at Albany three years ago: “When I played it for the first time, I said Teddy, I said I don't know if I can play this course, it's really, really hard. These are the smallest greens I've ever played. Same thing as Hilton Head. I think Hilton Head is one of the greatest golf courses but the small greens, me trying to play the golf course is just very difficult.” Sometimes actions and results speak louder than words. That seems the case with Bubba at Albany, who now has seven of nine rounds in the 60s here after his 60 today. A long coastal track with five par 5s. A string of big finishes in recent months. Yep, everything looked in place for Finau to have a big week. Well, nearly everything as there was a fly in the ointment. Finau may have rubber ankles but he has a troublesome Achilles Heel – Bermudagrass. A terrible record in Florida highlights it as do these numbers: Finau has lost 0.327 SG Putting per Round on Bermuda over his career, gaining 0.136 SGP per Round on Bentgrass. That’s nearly a two-stroke differential over the course of four days. Also note his top-10 rate. It’s less than 10% on Bermuda but 25% on other surfaces. Today he did little to dispel the doubts, needing two late birdies to shoot even par and end in a tie for 13th.